Mexico's Riviera Maya already draws millions of tourists every year with its pristine beaches, adventure parks, and magnificent Mayan ruins, but now, the country has unveiled a huge plan to lure even more visitors to the stunning region on its southeastern coast. On Monday, officials announced plans to to break ground on a sprawling new theme park packed with wild roller coasters, water rides, an enormous hotel complex, and many more attractions -- all designed to celebrate the country's Mayan culture and heritage. 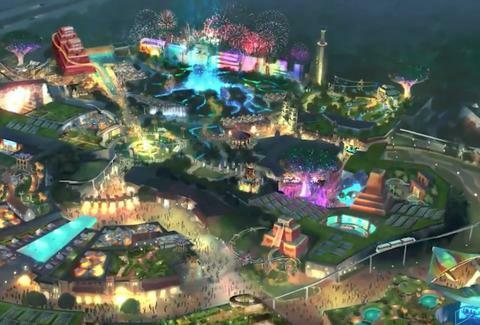 Basically, Mexico is building its very own Disney World, and you're going to want to go. Mexican President Enrique Peña Nieto announced official plans for the $840 million park, Amikoo, which is named after the Mayan pronunciation of "amigo," or friend. The major destination will sit on nearly 300 acres just outside Playa del Carmen, and should be nearly finished by 2020. According to Riviera Maya News, the park will boast at least 24 state-of-the-art rides and be split into four distinct zones: Park Maya Extreme (a lush jungle-themed area), Maya Adventure (a celebration of the "Maya City"), Maya Discovery (Mayan anthropology and archaeology museums), and Amikoo Land (a family-focused area with shopping and restaurants). While the development will occupy 300 acres total, more than 200 acres will be set aside as a preserve. There aren't many details on the specific rides quite yet, but it appears they'll include such thrills as a giant wave pool, panoramic flight and submarine simulators, and something called "Pirates of Bacalar." To get a true sense of what to expect, though, it's worth checking out the mini presentation video above, which is chock full of renderings. Once complete, the hotel complex will boast 1,200 guest rooms, and developers definitely expect to fill them. During his presentation, Mexico's president projected the park will attract some 4.5 million visitors every year. That's not quite the nearly 20 million visitors Disney pulls annually, but it's certainly the most -- by far -- of any theme park destination in Latin America. You'll have to wait a few more years to get the full experience, but the first phase -- a concert arena, convention center, and shopping mall -- is on track to be completed by 2018. Until then, you shouldn't have a tough time finding other cool (and cheap!) places in Mexico to visit.